Pratt & Whitney celebrates with Airbus and Delta Air Lines the entry into service of the airline's A220 aircraft powered by Pratt & Whitney GTF™ engines. Pratt & Whitney, a division of United Technologies Corp., along with Airbus and Delta Air Lines celebrated the entry into service (EIS) of the airline's A220 aircraft powered by Pratt & Whitney GTF™ engines. The momentous occasion makes Delta the first A220 operator in North America. The event was commemorated with a gate celebration at LaGuardia Airport in New York. In April 2016, Delta announced its order of 75 firm A220 aircraft with options for up to 50 additional aircraft powered by Pratt & Whitney GTF engines. In January, Delta added 15 firm aircraft, increasing its total firm order to 90 A220 aircraft. Delta also announced selection of the GTF engine to power its order of 100 firm A321neo aircraft in December 2017 with options for up to 100 additional aircraft. Additionally, Delta TechOps joined Pratt & Whitney's growing MRO network which supports the GTF engine fleet and Pratt & Whitney customers worldwide. "Delta has been a pioneer in the aviation industry for decades and today we celebrate another milestone with the Delta team as their new A220 aircraft enters service," said Rick Deurloo, senior vice president of sales, marketing and customer support at Pratt & Whitney. "Delta's GTF-powered A220 joins more than 330 other Pratt & Whitney powered aircraft already in service with Delta. 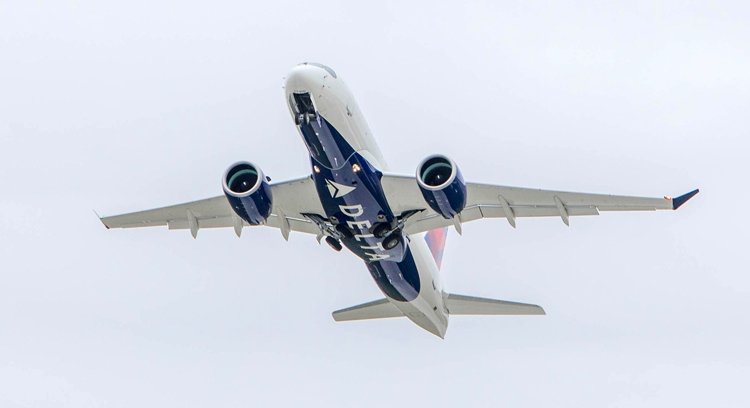 Pratt & Whitney and Delta have built a strong and trusted relationship over the years and we are confident that Delta will enjoy the GTF engine's proven economic and environmental benefits on the A220 aircraft." The A220, exclusively powered by the GTF engine, offers double-digit improvement in operating costs compared to current generation aircraft. It's 20% more fuel efficient and provides a 75% reduction in noise footprint and NOx emissions 50% below the ICAO CAEP 6 regulation. SP's AirBuz, a first ever magazine exclusively on civil aviation from India. A unique vehicle to showcase the phenomenal growth of the civil aviation industry.